An online 'tour' of our own houses, and an accompanying artist's book that focuses on an intimate selection of the tour. We hope that by acknowledging the past, discussing the present and investing in the future we not only develop our own relationship, but aim to raise an awareness of how we are connected to the places where we live, and to understand the psychology that underpins our furnishings, decor and household adornments. Our conversations are shown in the comments boxes. Outside the bathroom hang a row of gym bags on a set of old hooks (these were found on a roadside somewhere in Greece, and bought home as hand luggage, not your average holiday souvenir). The gym bags are my bathroom cabinet – the bathroom itself is small with limited free wall space – so the bags, which are themed – hold various bits and pieces; for example spare shampoo, conditioners and soaps in one – all things medicinal in another – etc. Is the medicine/bathroom cabinet endangered I wonder? The gym bags all hanging at various heights look like a bunch of endearing little characters, P (Are gym bags still used these days, or are they becoming and endangered species? Will have to ask next door's children). the bags appearance is varied enough to remember which bag holds what contents - or do you get mixed up? I'm wondering if the blue coloured bags hanging on their Grecian hooks remind you of those beautiful clear azure Greek skies - if so, I think they are a perfect souvenir. You hit the nail on the head when you asked if I can remember which bag holds what... the answer is no! 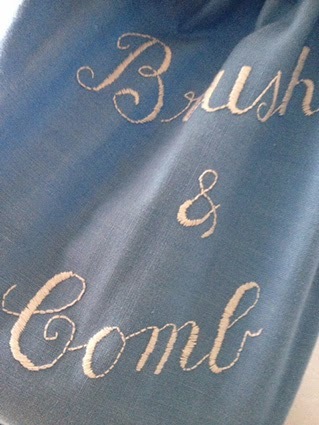 Nine times out of ten I get the wrong bag – apart from Brush and Comb, which is easy to remember as it contains shampoos and conditioners – (incidentally this is the only bag that I didn’t make – I was lucky to find it in a second hand shop – a £4 bargain!). I suspect you are right about gym bags becoming endangered – Granny made my gym bags – my favourite was a wide striped affair in different shades of orange – everything these days has to have either a name or a picture on it – anything from Peppa Pig or the latest boy band to Superman (I’m know I’m sounding old now!). Brush and Comb containing hair products is good - though I quite like the idea that it's like the 'memory game' every time you need a bathroom product, or are not washing your hair! I have now searched for gym bags - the 21st. century gym bag is a bit different, as you say, mostly branded. Or nylon. I'm wondering if children even wear black plimsolls now - or if there is actually still a gym 'kit'? (There is a whole section of society I have no idea about). What was your Granny's forte when it came to making? Brush and Comb update - when reaching for a new bottle of shampoo at the weekend, I noticed that there is a name badge stitched inside the bag - Felicity Cox (where is she now? )… I wonder if she sewed the bag or if it was made for her? Anyway back to business – I think A (aged 7) has a gym kit, although not sure about the black plimsolls; I seem to remember that as a 5 year old I did P.E in my vest and pants (and plimsolls!). In answer to the question about Granny – she was a seamstress – I think she must have been trained (although I have no details), as children she would make us various items of clothing including beautiful wool coats. In later life she was more likely to crochet then sew – anything from bikinis for my aunts (!) to cardigans and blankets, you name it, she could crochet it! She also taught me to smock (I wasn’t very good). Angie Butler (Pet Galerie Press) and Philippa Wood (The Caseroom Press). towards, and empathy with our work through it's publication. never been to, or seen each other's houses. we have decided to carry out some domestic archaeology.